I really discovered wine only about 4 months ago. I’ve had a few glasses in the past, but never really got into it until I took a long weekend trip with my wife to the Hunter Valley for our wedding anniversary. We live only a couple of hours from one of the world’s great wine regions, and it was the first time I’d really been there. And being a wine region, I decided it might be time to actually sample some wines and attempt to see what all the fuss was about. More about that trip later. Right now, and what really prompted me to start this blog, is the desire to record my impressions of the first time I ever tried pinot noir. Pinot noir, as I’ve recently learnt, is a cool climate grape, and makes a wide range of wine styles, but tending towards lighter and fruitier. 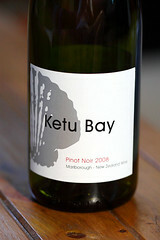 Marlborough in New Zealand is a cool climate, and apparently produces some decent pinot noir. This entry was posted on Wednesday, 17 February, 2010 at 22:36	and is filed under Wine. You can follow any responses to this entry through the RSS 2.0 feed. You can skip to the end and leave a response. Pinging is currently not allowed. Congrats on starting up the blog. I always had the vague understanding that whites were better in New Zealand and reds were better in Australia, because red wines required a warmer, dryer climate. It’s interesting to learn that rule is far from absolute. Blueberry Hill have a Pinot noir that IIRC they make from Pinot vines grafted onto Shiraz stem, making it possible to grow in the Hunter which is otherwise too hot.